PAGO CASA GRAN [Valencia] - VINOS LIBRES "just honest wines"
PAGO CASA GRAN, is a family run, organically farmed winery located in Muxente one of the highest parts of Valencia on the very edge of the MESETA de la Mancha. Laso Galbis family was involved in wine making during sixties and seventies in Casa Gran and Venta S. Cristóbal. They also had the ownership of the vineyards controlling the whole process. A new project called "PAGO CASA GRAN" was born in 2006 placed in the estate "Casa Gran" where the old winery used to be but with new facilities designed to keep the properties of the grapes that have been obtained from the vines. All grapes employed by "PAGO CASA GRAN" have been grown in our own estates "Casa Gran" is the main and contains another called "Casa Benasal" there is one more only a few kilometres called "Altet de la Ampolla". All properties are located in the valley called "Las Alcuzas", Mogente, Valencia, Spain. Monastrel Vines - with the Meseta looming in the background. 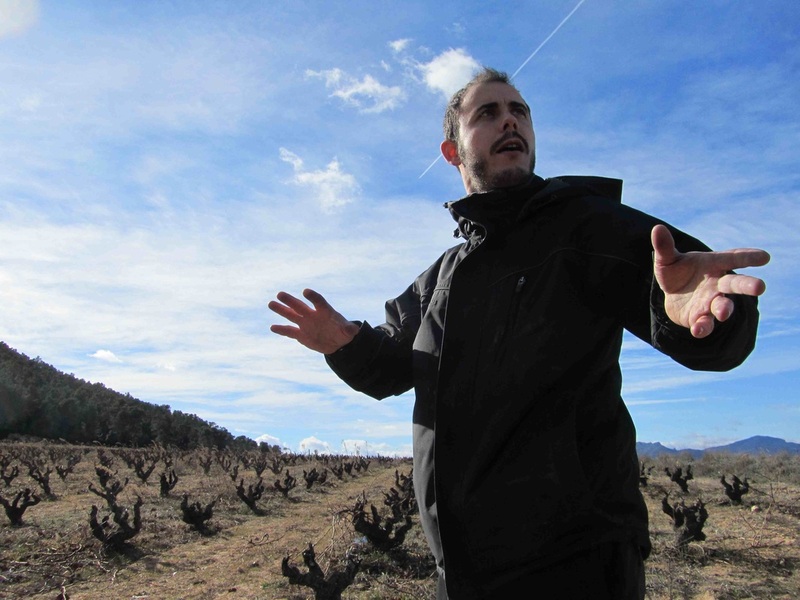 CARLOS LASO - The Proprietor, is Passionate about his powerful, inky Garnacha Tintorera. Carlos explains that this cast is native to Valencia and predates Alicante Bouschet. * We are in Organic Agriculture since 2005 and in 2010 we move further with the progressive implantation of Institute Delinat guidelines (developed around soil alive and biodiversity). * In order to obtain personality for our wines, we are using native yeast for fermentation and our vines are surround by permanent cover crop that helps to make the expression of the grapes more authentic. * Our wines are a combination of varieties because we think it gives higher complexity and it becomes easier to keep a line for the wines over different vintages. They call it an "OMVI" ... UFO in Spanish. This contraption is a flying 20hl tank that allows you to perform all the wine moving duties in a winery without ever using pumps. Here they are soaking the cap again - it takes just 30 "segundos" to return the wine to the fermentation tank and you get awesome aeration. This is a modern solution to the artisan way of making wine before pumps. Falcata "Arenal" - from a single sandy vineyard is the wine that Carlos Laso considers his greatest accomplishment. It is the crowning achievement and probably the greatest expression of Garnacha Tintorera available in Spain. This is a blend of more thatn 70% Garnacha Tintorera with Monastrel, Syrah and in some vintages a hint of old vine Merlot. 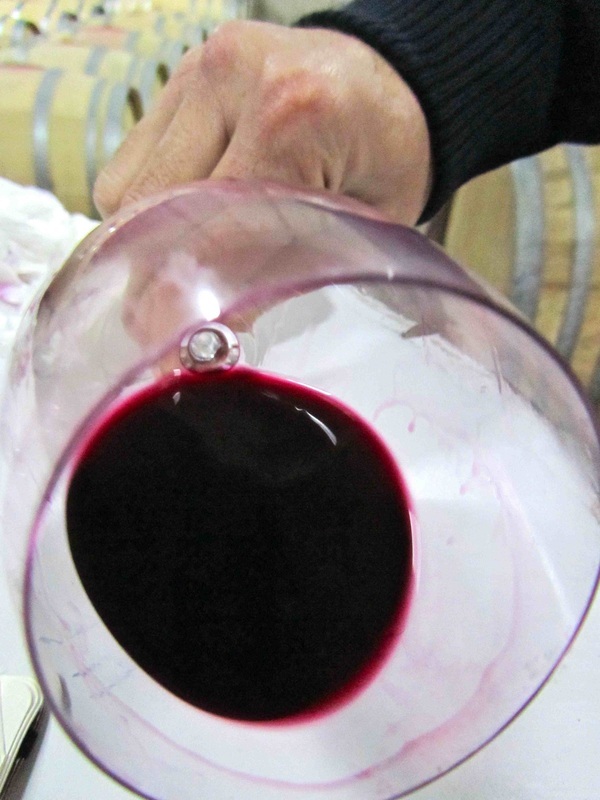 Only a portion of the wine spends 3 months in oak + it is unfined and unfiltered to preserve the pure essence of fruit. The wine is deep, layered, big and fresh all at once - some describe the experience as "profound elegance"
The name: Falcata was a fearsome sword used by the early Iberians against the Romans - in the hills above the vineyards ruins of an ancient village with early winemaking equipment has been discovered. Winemaking: Direct press of grapes not crushed. Racking by cold temperature and earth connection. Fermentation and maceration in stainless steel tanks (temperature below 14ºC). Each variety fermented with its own native yeast. Malolactic fermentation occurs stailess tanks. Wine stays on the lees for three months with frequent Battonage to increse volume and mouth feel. Winemaking: Fermentation and maceration in stainless steel tanks (temperature controlled).Each variety is fermented with its own with native yeast. 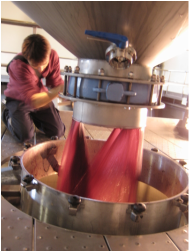 Long and soft extraction of tannins, punching down the cap manually. Malolactic fermentation in stainless steel tanks ... Battonage of lees was performed to age the wine during 6 months. Vineyards: Un-trellised organically farmed bush vines, grown in sandy soil. Vineyards: Un-trellised organically farmed bush vines, grown in sandy + clay soil. CRUX - The heart of the matter...This wine expresses the soul of the vineyard.